Summer is finally here; the temperature has been rising, excitement has been building, and our mouths have been watering in anticipation of all of the beautiful summer produce that is coming our way. Bright juicy peaches, vibrant strawberries, deep red plums, multi-hued heirloom tomatoes, vivid green peppers, a rainbow of summer squash… the list goes on and on. Since many of us eat with our eyes, there is something intuitive about adding the vibrant color and hues of summer to our dinner plate that takes our exploration of food to another level. 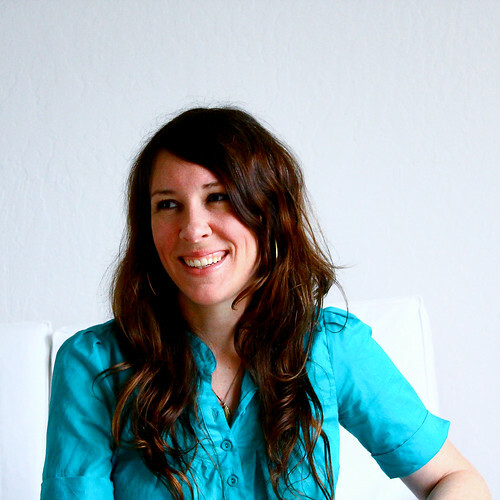 San Francisco-based Kimberly Hasselbrink, food photographer and creator of the acclaimed The Year in Food blog, would probably agree. 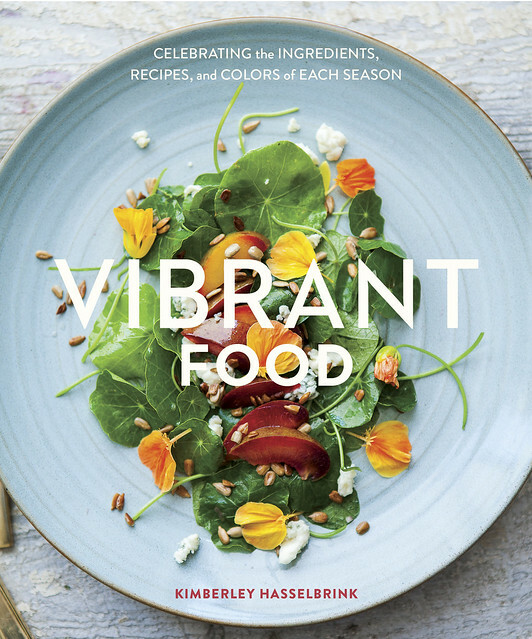 Hasselbrink brings us on a colorful journey with her cookbook Vibrant Food. She begins with a single ingredient at the peak of freshness and much like an artist, allows color to be her guide. Each recipe pays artful tribute to the season’s magnificent bounty. Organized by season, the 60-plus recipes, ranging from delicious dinners like Green Rice Salad with Nectarines and Corn to fun summer treats like Summer Berry-Coconut Milk Ice Pops – are broken down by type of seasonal ingredient. This cookbook contains sensible recipes for the home cook, while still inspiring readers to seek out food in new and creative ways. We are just kicking off the summer season and I’m guessing that a colorful recipe book that highlights the season’s most appetizing line-up might inspire you. To win a copy of Vibrant Food, simply leave a comment below answering this question by Tuesday, July 10, 2018 (one entry per person please). What is your favorite vibrant summer ingredient and why? Peaches!! They are the epitome of summer and go great in sweet and savory dishes. Congratulations Jessie and thank you to everyone who participated! . No purchase required. Limit one entry per person, please. Entries will close on Tuesday, July 10, 2018 at 8:00am. Winners are chose by Random Number Generator and announced on our blog on Tuesday, July 10, 2018. This just might be the most refreshing salad I’ve ever eaten. Green rice is a great starting point for a big, summery grain salad. The sweetness of the corn and nectarine plays well off the cool, green herbal notes and the heat of the rice, rich with cilantro, jalapeno, and green onion. Cheese, as always, makes it even better. In a saucepan, combine the rice and water, cover, and bring to a boil. Lower the heat and simmer, covered, until the liquid has been absorbed and the rice is tender, about 30 minutes. Let the rice stand for a few minutes, then fluff. Set aside to cool to room temperature. To grill the corn, lightly oil both ears of corn and place in a small baking dish. Broil about 6 inches from the heat source, turning every few minutes, until golden and blacked in spots, 10 to 15 minutes. Transfer to a plate and set aside until cool enough to handle. Using a large, sharp knife, cup the kernels from the cob to yield about 1 cup. If you have more than this amount, save it for another use. Transfer the kernels to a bowl and toss with a pinch of salt and a squeeze of lime. Set aside. Transfer the rice to a large bowl. In a blender, combine the cilantro, parsley, jalapeno, lime zest and juice, olive oil, a pinch of salt, and 1 tablespoon water. Blend until smooth. Add up to 1 more tablespoon of water to thin the sauce if it’s too thick. Spoon the mixture over the rice, scraping any remaining sauce out of the blender with a spatula, and mix until the rice is evenly coated. To finish, add the corn and additional parsley and cilantro to the rice. Toss to combine. Transfer the rice to a serving platter. Sprinkle the nectarines and queso fresco over the rice in even layers. Garnish with additional parsley and cilantro. Best served immediately. Can be made up to a day in advance; bring to room temperature before serving. Strawberries! They work in any meal in any course, they are delicious and cherry and scream summer! Especially over ice cream! I love fresh picked vine ripened tomatoes. Dripping with sweet juices when bitten into, or tossed with homemade pasta, olive oil and basil, melding into a real evening treat! I love corn because it adds a pop of color and I enjoy the taste! My favorite ingredient is really anything that comes out of my garden during the summer, but if I have to pic just one is the raspberry, fresh and warm off the plant and ready for anything from a glass of wine to dessert! Watermelon! The color is vibrant but there are new ways in current cookbooks to fix watermelon in the summer. For example: wtermelon cabreze. Tomatoes, without a doubt, are my very favorite, vibrant summer ingredient. From compact little golden flavor bombs to deep crimson and purple heirlooms, tomatoes come n every shape, size, and color. They co-mingle with sweets and savories. I love a traditional caprese salad with rich red grape tomatoes, fresh basil and mozzarella and less traditional capreses with tomatoes and stone fruit mixed with mozzarella and mint. Then as the days shorten, the plump, tart green tomatoes bathed in buttermilk and jacketed in seasoned almond flour make for a bright accompaniment to summer meals or even better, a non-traditional "bun" for grilled burgers. Finally, as the leaves on surrounding trees try to match the golds and reds of those lovely tomatoes, we gather them up and spend hours on Sundays blanching and canning so that come November, we can revisit the brightness of summer with the tang of canned romas topping spiraled zucchini. The lore of tomatoes is as colorful as the fruit. A member of the nightshade family, they were not always prized as supper table superstars. In fact, my grandmother, who lived from 1907 until 2007, recalled that her family called them "love apples." She said the people thought they were poisonous so they didn't dare eat them. Perhaps because they are Nightshades, their reputation grew as deadly to eat but lovely to look at. We grow all of our tomatoes from organic, non-proprietary seed in organic soil. They are the quintessential taste of summer. Peaches for sure! I can not think of anything more mouth-watering than a juicy, perfectly ripe peach!! YUM!! Parsley!!!! All varieties. It's fresh! It's green! Its cleansing! Love it on everything! I have to say Heirloom tomatoes because they come in so many different, vibrant colors — and are wonderful in salads! My favorite vibrant summertime food would have to be Raspberries… Simply the best sweet/tart flavor & crazy bright color! Any of the reds (starting with Cherries, going into tomatoes, sweet peppers and watermelons). Combined with the greens of summer the red vegetables and fruits make the most vibrant and contrasting plates – we eat first with our eyes. The red's also are high in antioxidants, and so hydrating. If I had to pick one red, it would be the tomato. So versatile in every stage from appetizer to entre', to deserts! I can make ice cream, a panna cotta, a cake, or granitas, & cookies too! This is the most flexible summer fruit/veggie ever. I guess my Italian roots are showing. Go Tomatoes! My raspberries! They are there for us for breakfast and again for a second pick to add to our evening meal. We miss them terribly come winter! I love edible flowers and fresh herbs for my salads and drinks! My favorite is cherry tomatoes. Their vibrant color and bite size make them a favorite in recipes as well as a pop in my mouth snack that is so refreshing and sweet. Fresh homegrown tomatoes! Add some cilantro and red onion and a squeeze of lime! Berries are my favorite summer vibrant ingredient – they go with sweet or savory applications, from grilled meats to green salads. Add them to smoothies, toss on a salad, simmer for a sauce, or eat fresh with nothing added. To me, they are the most versatile summer food. I love Nectarines. I used them in desserts, salads and main dishes because they are so flavorful, juicy, and versatile. Garlic Spears! They're a PNW summer fave! Blackberries! They are so delicious and beautiful hanging on the vine. It's fun to pick them in the wild with family or friends and then make something amazing later at home. Beets are colorful and complement a salad! I love fresh strawberries and blueberries. Today I’m looking forward to mixing them into a salad for the Fourth of July! My favorite is raspberries. I love them with melons as dessert; I love them in spinach salads with a touch of tarragon vinegar dressing; I love them with cream or mashed with almost no sugar and frozen into raspberry ice to put in punch of all kinds; adding a few ripe raspberries to green tea and serving it chilled is delicious on a hot day; raspberry pie is my all time favorite pastry; if there is better conserve than home made raspberry jam or syrup, I can't imagine what it could be. But best of all is going out to my raspberry patch this time of year and picking the first ripe berries, warmed by the afternoon sun, and eating them out of hand, slipping a few to my husband and the kids. Ahh. Summer is such a treat! My favorite summer ingredient is tomatoes. I started a garden to pursue the elusive tasty tomatoes that you cannot by in a store. I eat the cherry tomatoes right from the vine, I use others in a tomato tart, and I make sauce to freeze for winter. There’s just something better about the flavor of home grown tomatoes. My favorite has to be corn, I love roasted corn on the cob with butter and Parmesan cheese. Leftovers can be cut off and put in another recipe. My favorite summer ingredient is the Apricot. It is great to eat fresh! It is a great addition to any meat dish either cooked with the meat or as an accent. Try layers of sliced ripe apricot with layers of fresh grilled red and yellow beets on a bed of mixed arugula and basil leaves with a drizzle of olive oil and balsamic vinegar!! YUM!!!! Peas! Eaten fresh out of shell or in salads, it reminds me of summer as a child. But any summer vegetable is a winner to me. Corn! Or peaches…. but cherries though! Peaches & nectarines 🍑 because I can use them in both sweet and savory dishes. But they are best grilled! I love peaches and nectarines. They are so refreshing and the season just seems to short. Lambs ear and kale! Lambs ear makes a wonderful tea tasting like apples and a kale salad with a few apple pieces and dressing make for a wonderfully light and healthy dinner! Spaghetti Squash – I love to combine it with tomatoes and cottage cheese to make a delicious and healthy lasagna. Its always fun to convince someone new to try it and they are surprised they love it! BLUEberries. They bring back childhood memories and make current recipes pop. Cucumbers fresh from my garden! I grow the long English variety, slice them thin and add a bit of white vinegar with a dash of sugar for a crispy, tangy addition to summer meals. I love cilantro. It brings a bright flavor to so many things. I also like to use watermelon in salads as well, solo juicy. Nectarines. I wait all year for that heavenly smell. They are so sweet and juicy. Bing cherries because of their rich color and sweet taste but also because as in life all good things have a price. In this case, it is the seed. You must work to remove or spit it out first making the cherry all the more delicious. Fresh summer fruits and berries. I love baking and nothing beats fresh homemade pies, bread, desserts, and anything else you can bake with them. Tomatoes!! There are so many varieties and colors. There are so many ways to prepare them. Or you eat them straight of the plant. One of my favorites from when I was little at my grandmother's is just a fresh meaty tomato from my grandpa's garden, grams would slice them up and put some cottage cheese on top with a little black pepper. Perfect on a hot day when you don't want to cook. Cherries because they’re sooooo yummy! I love making salads in the summer. Grilled corn and nectarines sounds so delicious! Basil! Sparks up my eggs in the morning, salads, drinks. My favorite go to ingredient that surprises my guests. I always grow it in my garden in the summer. Watermelon!! Best summer ingredient because of the vibrant pink color and delicious juicy refreshing ness! It is one of my goals to try grilling it this summer. Tomatoes and watermelon! They are the first sign and the last sign. And so wonderful. I just made a tomato orzo by crushing a bunch of them to make liquid then slow boiling the orzo in it! Yum! Peaches ripe of the tree. Love fresh berries in the summer! Fresh basil and tomatoes straight from garden to plate because these ingredients never taste that good from a store. I love watermelon in the summer! It’s so refreshing to just eat out of the fridge for a snack, as a dessert, or on my boat. I feel like I’m being hydrated when I’m eating it as well which is great when it’s hot out. I also love bringing the classic watermelon, mint and feta salad to BBQs or parties. Yum! This cookbook looks amazing. I just love the breadbasket of great fresh foods from Northern California. My favorite summertime vibrant recipe is a chilled Zoodle Caprese Salad. A nice mixture of classic Italiano & California!! Pluto from my backyard! Put it on top of bone-in pork chop and grill them! Strawberries! They are delicious and can be included in a sweet and/or savory dishes. Plus they add a pop of color. Heirloom tomatoes, they are so delicious by themselves but also are perfection in so many recipes. That is a hard one!!!! Just 1???? Okay well the biggest abundant staple in my summer garden would be tomatoes but that seems so boring!! LOL Harvesting of the spinach, blueberries, parsley, mint, corn, strawberries, limes, avocados, watermelon make meals way more fun!!! GO SUMMER!!!! Must I pick a favorite? To tell the truth, I am still learning about what’s out there! That’s why I love Full Circle! For example, and it is JUST one, I never tried fennel (well, not the whole fresh plant) before. I love it. I love kale! Vibrant, rich and substantial in a salad, great blanched, and adds nicely to a summer soup. Every berry mentioned already and all sorts of tomatoes! Tomatoes are my summer favorite because they are so juicy, flavorful and versatile. I love beets because they are so sweet and rich tasting— pickled, roasted, in salad— and so beneficial to great health! I love fresh raspberries. The color, the flavor are perfect with salads, desserts and even chicken or fish. I can't get enough of them. Freezer jam helps to remind meow them all winter long! My favorite summer ingredient is berries of all kinds. I love them because they are so delicious and versatile. They can be used in sweet and savory dishes. They explode with flavor! Yum! Peaches! I remember as a child going to the peach stands with my parents and the agony of waiting for them to ripen! They are so versatile. They can be eaten not only plain for a snack but with any meal. They can be made into salsas and marinades or delicious desserts. Blueberries. I can put them into so many dishes! Smoothies, oatmeal, salads, the dogs eat them frozen, I eat them just fresh…. there are SO many recipes! I love all the variety of vibrant colorful and flavorful fruits of summer…cherries, peaches, nectarines, and always the fresh berries! Cilantro! Freshens and brightens most any dish – fruit, vegetable, or meat! So hard to pick just one….I love them all. I have to say, though, that there is nothing quite like the perfect tomato on top of Full Circle lettuce with a homemade French vinaigrette. That is heaven a partnered with a glass of crisp white wine or Pellegrino. My Favorite go to is strawberries! They are bright, delicious, and sweet! They can be used in salads, deserts, and stand alone a! Nectarines, especially white nectarines. They easy to prepare, no peeling and they separate from the seed easily. They have a wonderful taste, are not mushy, can be incorporated into many different dishes and I love them because they arrive in my favorite season "summer". Corn! Because it's really only good in the summer, and it's SO good! I love throwing roasted corn in my salads, burritos, soups, whatever!! Sorry autocorrect – should have been "they are". I love all summer fruits and vegetables. It's impossible to pick just one. Once you start eating seasonal and local, you'll never go back to the tasteless produce available in many grocery stores. Watermelon! Make it sweet, make it savory! Make dessert, salad, soup, cocktail—the list goes on! Fresh blueberries to use in desserts with chocolate. My favorite vibrant summer ingredient is the fig. The fig season is very short in the PNW, so the minute it's available, I am wanting mashed figs and blackberries, fig slices astride hand-cranked low sugar fruit sorbets, mashed into a dipping sauce for barbequed meats, and wrapped in prociutto and drizzled in balsamic vinegar. Watermelon. Not so much an ingredient but I could Live on the stuff. For an ingredient I would have to say pears usually bosc for the firmness. I mix it into just about everything for a little sweet. Really good in chicken salad. I love blueberries because they are nutritious and cool and soothing on a hot day! I core an apple, fill it with blueberries, chopped walnuts, and a drizzle of honey, and eat them when I go hiking or any time as a snack. Peaches … especially when the juice dribbles down your chin. Mangos are a favorite vibrant summer ingredient I use in sweet or savory dishes. They are vibrant in flavor, aroma, and color and remind me of Hawaiian hospitality–a generous abundance that brings warmth to the heart and a smile to the face. Golden Raspberries have such a nice mild flavor and vibrant color. Add them to a salad or dessert for a late summer treat! My favorite summer food is peaches. There are so many was to use them, salads, desserts, compotes, accents, drinks, and many more. It has the most vibrant taste of summer. Fresh raspberries have been my fav since I was a child. Berry picking is a lot of work, but oh so worth it when you get to enjoy that sweet tart pop of flavor in a berry pie, a refreshing cocktail, or my favorite raspberry freezer jam! We have 21 Pepper plants in our garden this year! Definitely our family favorite because of all of the options. Summer peppers to sweeten up a dish especially morning frittatas; spicy peppers to make my husband happy! Fresh sweet corn, grilled in the husk—with butter if eaten off the cob. Grill extra to have leftovers for salads and other dishes. Yum! I love cucumbers. Their coolness, crispness and taste is perfect for summer feasting. Strawberries and raspberries to eat fresh, with rhubarb for making a crisp. All organic of course. Corn, because I love eating fresh corn salad. Delicious fresh juicy summer peaches are the jewel of the season. Super ripe tomatoes, you just cant beat them, esp with a sprinkle of salt – delicious! Favorite summer vibrant ingredient : blueberries / blackberries – blueberries are excellent by themselves or in salads or desserts; and fresh blackberries off the vine – they grow wild where I walk and its great to pick off a handful and eat while enjoying the warm sunshine and the fresh air! My favorite summer time ingredient Asparagus. It’s wonderful in salads or a stand alone dish. We love the woody flavor and adding it as a accent to many dishes. It’s something special that goes well with Thai food to French food. I love the fresh peaches! They are great for breakfasts, snacks or as an addition to a dinner salad. Plus they aren't something you can get all year round fresh, so I take advantage of the season :). Jackfruit! They are so versatile and delicious, great meat alternative and taste great with any sauce. Peaches have to be my favorite ingredient that depicts "summer". Barbecued just enough to bring about the smoother sweet flavor and added to chicken dishes. Looks like it has some great recipes using fresh ingredients! Watermelon! Sweet or savory or juiced, it's delightful and such and sweet soft color! Fresh, ripe tomatoes, because I LOVE tomatoes and miss being able to pick one from our garden in Oregon on my way to the school bus stop. Berries! They can be apart of the main course or for dessert. Picking just one is so hard! I would say the stone fruits, strawberries, and arugula. Together or separate they are all delicious, fresh and versatile. Fit any meal from breakfast, brunch, lunch, dinner to dessert! Looking forward to my first box next week! Tomatoes for sure. They only really taste like tomatoes in the summer! Fresh fruit is my summertime weakness. I love watermelon, nectarines, cherries, peaches, strawberries, rhubarb … just to name a few. All of these are delicious by themselves, but they're great to mix and try new recipes with (like the rhubarb). Squash blossoms. Beautiful and delicious, and a bit fleeting like summer. Fresh home grown sugar snap peas are my favorite! I love picking them right off the vine and munching a few before taking the harvest inside. They are just so sweet and crunchy and they truly make me think of summer. I love fresh herbs from the summer garden: basil, cilantro, mint and more in abundance! It makes everything taste so light and earthy. Blueberries, picking them right off the bush and including them in salads, cobblers, jams and shortcakes. We really love our vegetables and certainly in the summer is absolutely the best time to enjoy so many! This year though the green beans have been tremendous and we are finding a variety of ways to enjoy them!!!! I love the fresh herbs and squash! It has to be blueberries! Not only are they gorgeous little bundles of plump deliciousness, but they are packed with antioxidants. They look amazing in salads, over salmon, or as a dessert with a dollop of cream fraiche. Oh heck…they are especially great just eaten by handfuls straight off the bush!